Many singers would like to learn How to sing from diaphragm. The diaphragm is basically the muscle below people’s lungs and slightly above the stomach responsible for controlling inhalation and exhalation of breath. Most people have heard singers being advised to breathe using their diaphragm every time they sing. 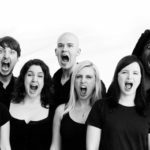 In case you have been involved in singing for a considerable amount of time; I’m sure you have come across certain methods of how to sing from diaphragm. However, what exactly does this entail? What is a diaphragm and what is its use? 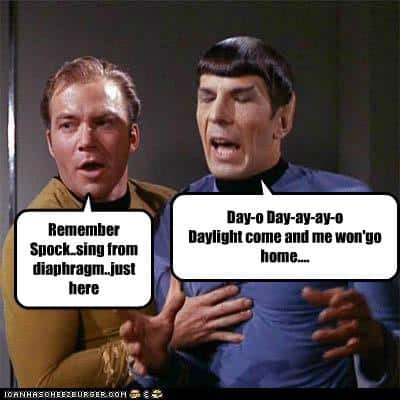 Let us first consider what themeaning of the word diaphragm and its connection to singing. 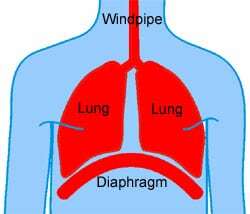 How The Diaphragm Works While Breathing? Your vocal chords are like that of a musical instrument. 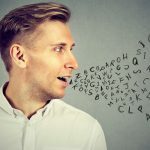 While singing you need to have full control of your voice to hold notes properly and for a long time, bring dynamics into your voice to express the intended feeling, and to sing without a break or crack in your voice. This can be achieved only if you build and strengthen your vocal chords with breathing through your diaphragm/stomach. Diaphragm is the muscle below your lungs and just above your stomach which controls inhaling and exhaling of breath. You must have often heard people say things like, ”Breathe from your diaphragm when you sing”. You might have wondered why people say that when you know you are supposed breathe with the help of your lungs. What they actually mean is proper breathing is a major requirement for proper singing. Once you develop breath control, you will be able hold long notes, improve your tonal quality and throw your voice to a larger distance. As babies all of us are born with correct breathing capabilities. That is why a child’s wail can be heard at a long distance even when its lungs are so tiny. Since as children we do not know the wrong way of breathing our voice resonates and can be heard loudly and clearly. It is as we grow up that we take shallow breaths from the top part of our lungs resulting in voice breaking and gasping at even a little effort. 1. Familiarize with muscle coordination that deals with singing. The diaphragm, which is a type of muscle that is under the solar plexus, moves to draw and shove air in the lungs. To bring out the best aspect of shallow breathing in singers, the top lung regions work by leaving absolutely no work for diaphragms plus half used lungs, leading to short breathes. Therefore, get more lessons on breathing deeply using the diaphragm. 2. Try to stand or sit erect when singing. Curved postures make it relatively impossible for singers to breathe using their diaphragms. If you want the best results on how to sing from diaphragm, avoid curved postures because they limit the circulation of air and equally damage song delivery. 3. Proper positioning. While standing, the back has to be straight, feet should be shoulder width apart and chins parallel to the ground. By slanting the head backwards when singing, you will damage your vocal chords and in the same way, deter air circulation. 4. Diaphragmatic Breathing Exercises. As you practice daily on your singing skills, take at least ten minutes to exercise on your breathing. Sit on the ground and fold your legs and allow your hands to rest on the knees. Gradually breathe in until you are able to feel the air in your stomach expanding. While counting to ten in your mind, hold on to the breath then exhale as you gradually breathe in. This is an obligatory exercise for anyone aspiring to be a good musician. 5. Confirm breathing abilities when singing. Make sure that your palm is on the solar plexus and begin singing using less complex scales. If the breathing mode is appropriate, you will feel the palm being pushed outwards due to stomach movements. This is the best way of improving on voice control and singing techniques. 6. Open your mouth when singing. The same way we focus on taking deep breaths, freely allow air circulation when singing. Therefore, it is necessary for musicians to sing with their mouths open and throat muscles relaxed. These tips come in handy by enabling voice throwing, volume control and proper diction. to assist in the process of inhalation. It descends as you inhale thereby displacing stomach upper intestines and viscera. The diaphragm has no direct role in the process of exhalation however it has certain control over the speed of breath exhalation. The act of breathing out is under the control of the whole abdominal system that is found between the naval and the pelvis. The moment you breathe out fast, the diaphragm becomes generally inactive although when the exhalation is slow the diaphragm will resist the normal breathing action for the abdomen. Attempting to exhale extremely slowly will allow you to notice you are in control of the breathing out but only for one or two seconds. Thereafter, breathing goes on without any effort. The diaphragm ensures sufficient exhalation, which is quite amazing, isn’t it? The moment you exhale fast, you are the one in control of the process. By attempting both these methods, you will notice the difference. During the process of singing, it is as if you are slowly exhaling long breaths during the whole song. You will tend to attempt to put them under control, however for those long notes it is the diaphragm that needs to take control. This is a natural occurrence. Everyone has a considerably firm diaphragm despite the height or size that they might be. What the diaphragm requires is control and not strengthening. You need to be aware of how it functions prior to attempting to control it. The vocal chords that you have need not be a barrier to excessive pressure as a result of breathing. Rather, they are required to have sufficient pressure, which will assist in the maintenance of sound vibrations. In case there is an excessive pressure fall within vocal cords, they tend to bunch up tightly and this means that they cannot perform normally. When singing, the epigastric region need not be pulled in rather it needs to be in the same state as when it is filled with air after inhalation. This is just before a tone begins. This may sound contrary to what may be considered as right however if you are keen you will find that if you inhale deeply and breathe out partially or fully prior to singing a note, you notice that you easily become breathless. The reason for this is that the diaphragm has already moved downwards. Therefore, breathe in deeply and ensure that you do so correctly and this is by extending the abdomen a little bit and not extending the chest. Now start singing and let the diaphragm begin its work. You will find that singing long phrases or holding notes for extended periods becomes much easier by reducing breathing problems. If you want to improve your range in singing, you should learn these diaphragm singing techniques. 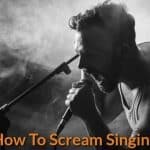 Although you may be gifted with a beautiful voice, but if you have no ability to sing a high note longer, then, you should focus more in learning your singing lessons so that you can make your voice stronger. Put your index finger an inch away from your lips and start exhaling. While you’re breathing out, try to observe how your diaphragm moves. While you’re singing, there’s no need to push too hard in taking out the air from your vocal cords. Another method is standing in front of the mirror, and put your both arms in parallel position. See to it that your fingertips are touching each other. While you’re inhaling, stand still and don’t move your shoulders or upper chest. The process on how to sing from your diaphragm also involves breathing some air to fill your stomach. Here, you should do it gently without forcing the air in it. When you exhale, you should make your stomach contract. Make it a gradual or natural process instead of forcing the air out. The purpose in doing this is to condition your stomach/diaphragm in controlling the airflow. You can be sure that by doing this controlled process of breathing, you’ll be able to hone your skills in singing. The moment you fill your stomach with air instead of filling your chest, this process will make the air last longer. This way, you can sing high notes easily. If you already mastered this technique you should perform these exercises everyday. When you become used in controlling your breathing in singing a song, you’ll be pleased to observe that audience will appreciate every note that you sing.